Adding RGB lights to the mix sounds like a simple task to carry out, but manufacturers who want to do it right need to consider a companion app that can control and customise the illumination to the desired effect. 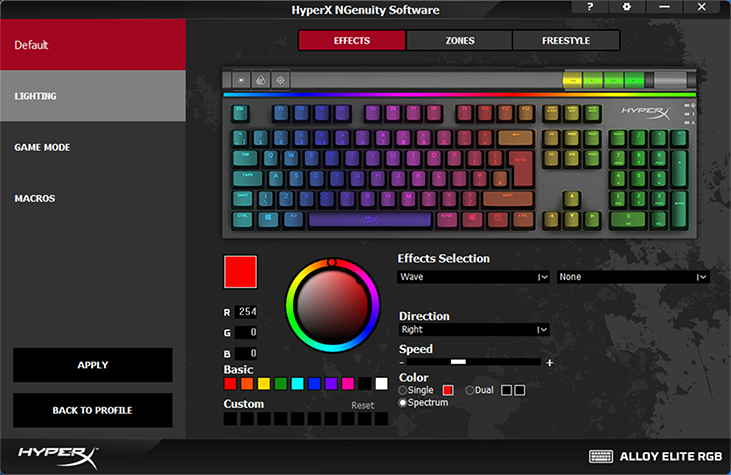 Playing catchup to the rest of the field, Alloy Elite RGB is the first HyperX peripheral to utilise the firm's NGenuity Software. Introduced as a standalone installer, as opposed to a preferred Windows Store app, NGenuity is free to download and covers most of the basics without pushing the boat out in any one regard. The lighting tab, pictured above, can be considered reasonably competent, with a good range of built-in effects and plenty of scope for customisation. 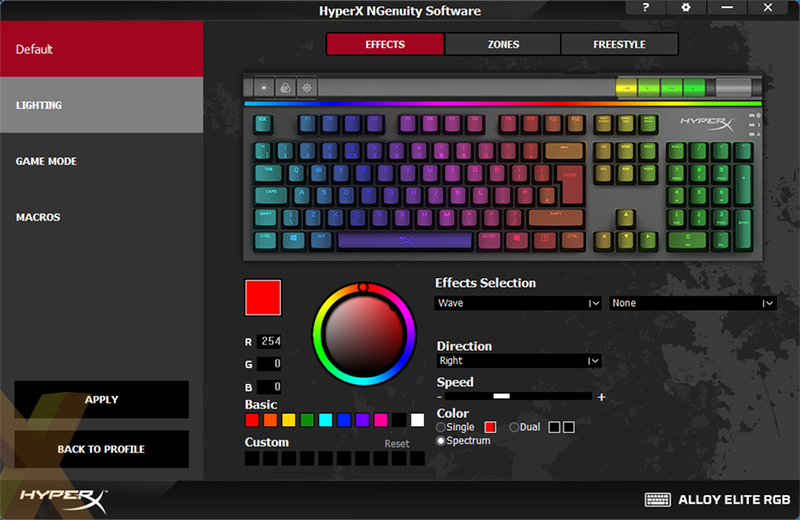 On the other hand, if you're used to the likes of the Razer Chroma, you'll find the HyperX implementation relatively simple - there's no vast library of user-created profiles and you won't be synchronising your keyboard with your Philips Hue lights. At least not yet. Ensuring the essentials are handled with ease, NGenuity is simple to get around with only a few tabs to navigate. 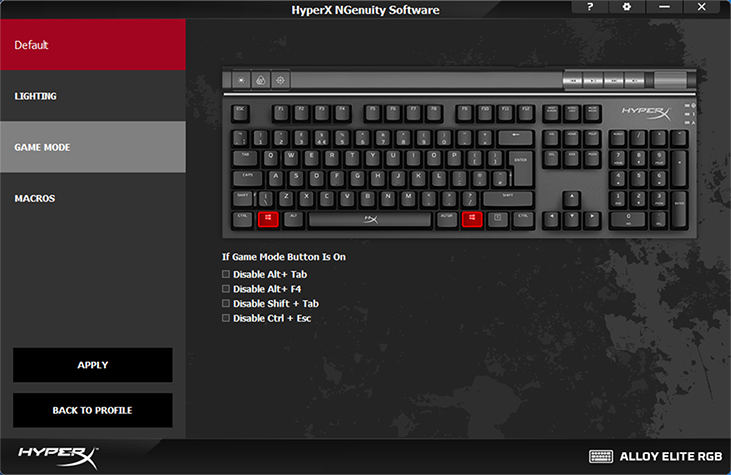 Game Mode, pictured below, allows the user to click and select which keys are disabled when the feature is enabled via the quick-access shortcut. Other potentially irksome shortcuts, such as Alt+F4 or Ctrl+Esc, can also be disabled by simply ticking a checkbox. 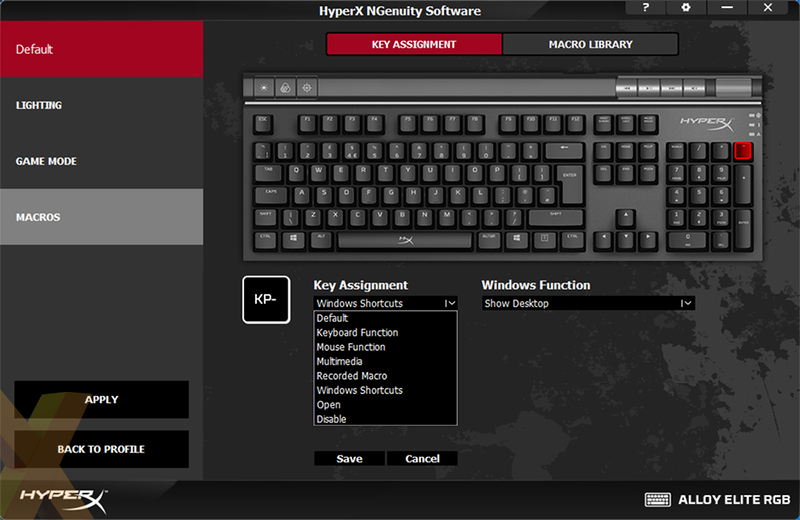 Re-assigning keys and recording macros is straightforward enough, there's enough memory inside the keyboard to store three onboard profiles, and the software's built-in library of game profiles has grown to include popular titles such as PUBG and CS:GO. 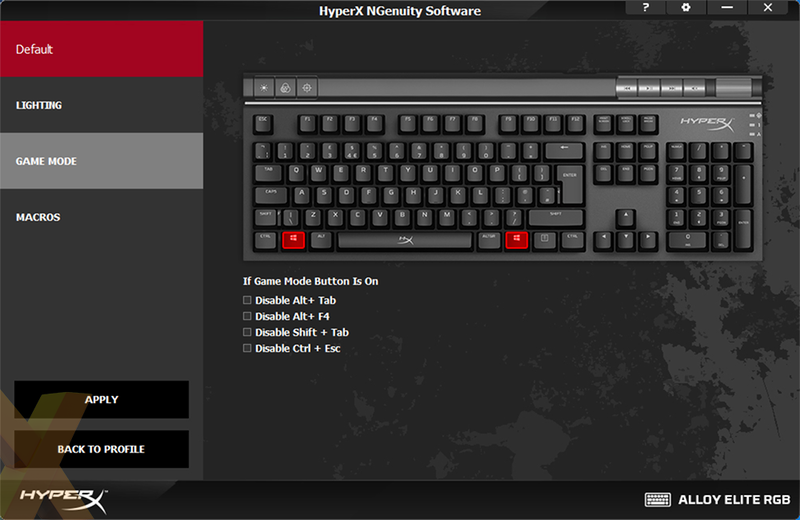 HyperX knows that NGenuity isn't a class leader as yet, but the software is developing nicely with periodic updates and we're told to expect "new features and future compatible HyperX peripherals" in the months ahead. 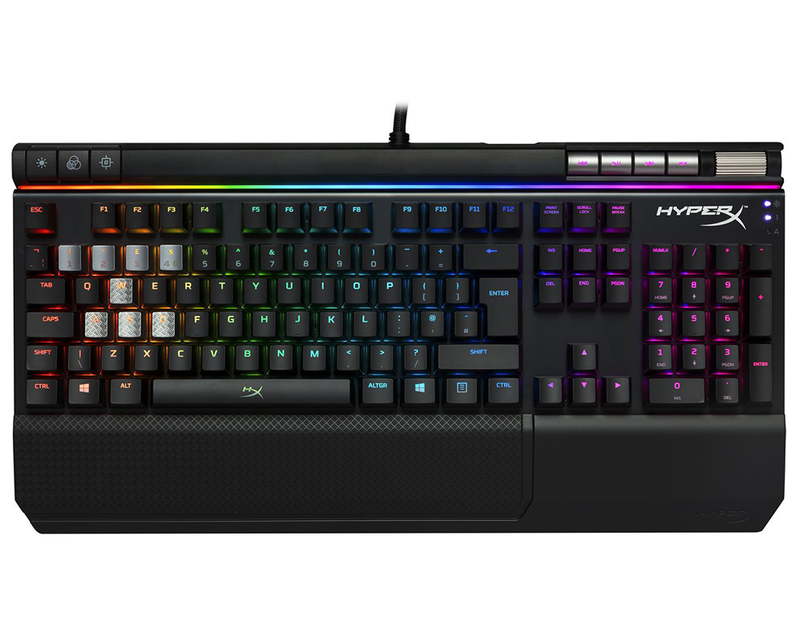 HyperX isn't resting on its laurels and, with the hope of becoming a go-to manufacturer of PC gaming peripherals, has updated its portfolio with a multi-colour keyboard, the Alloy Elite RGB. 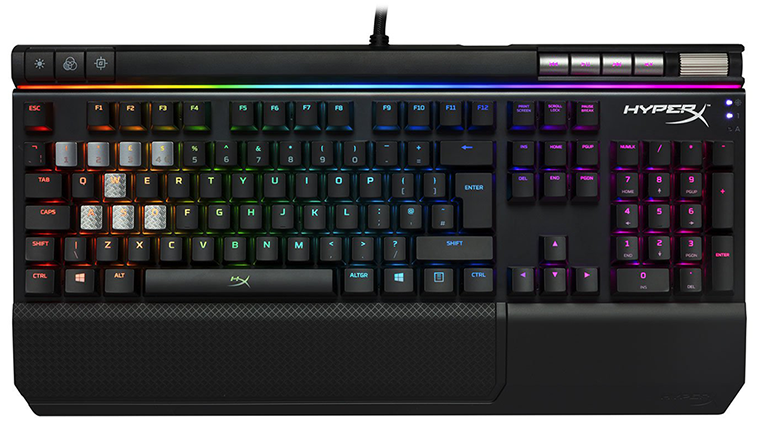 Priced at £150, the keyboard's strengths include a steel reinforcement plate, dedicated multimedia keys, favoured Cherry MX mechanical key switches and a bright, vivid RGB backlight further emphasised by a dedicated light bar. Has HyperX done enough to stand out from the pack? A higher quality palm rest, USB 3.0 passthrough and broader software functionality are needed to elevate the Alloy Elite RGB from good to great, but this remains a welcome addition to the company's growing stable. Bottom line: want a mechanical gaming keyboard that looks the business, feels solid and has that treasured Cherry MX action? The HyperX Alloy Elite RGB deserves a place on your shortlist. The HyperX Alloy Elite RGB is available to purchase from Scan Computers. Seems to be a hefty premium for something that has been done better many times before.